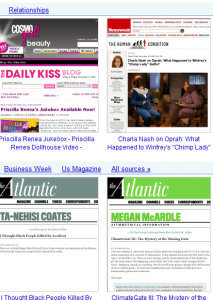 Google’s Fast Flip (see it here) gives you thumbnail images of a variety of magazines and newspapers. Flip through them to decide what you want to read. You don’t have to pay for anti-virus programs. There are plenty of free solutions out there. We”ve just converted to “Avast,” which comes in a free version. (Get it here.) But we’ve also had good success with the free version of Grisoft AVG (Click here.) and with Avira (Get it here). For anti-spyware, there’s Spybot Search and Destroy or Malware Byte’s Anti-Malware. Anti-Malware isn’t free, but it does a great job of removing spyware. The free Spybot works well too, if you don’t mind being constantly asked if you want to keep a process going or not.